Children need individual attention and special handling! Each child learns at their own pace. 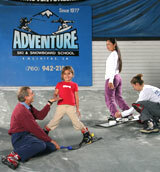 With more than 30 years experience teaching children, Adventure Ski & Snowboard School has found that children learn best with Private Instruction. 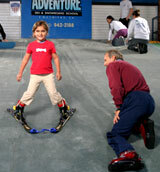 This is especially important in the beginning level of learning a new, adventurous activity as skiing or snowboarding. Private lessons allow each person to learn at their own pace. By not having to wait for someone else to "keep up", OR feeling like you're holding-up the class, private lessons can help most people to concentrate on the task at hand and benefit from the individual attention offered by their instructor. Our children's Private Instruction, "hands-on" instruction, where we start off holding the front of the skis &/or snowboards to help ensure they stay on their feet, will soon turn into confidence and independence!! Our warm, dry, and more controlled environment is the best way to help your child learn or improve their technique, get used to getting in and out of their boots and equipment, and to be introduced to good fundamentals that they can build on in future seasons. What a wonderful way for the entire family to enjoy your outdoor vacations more! 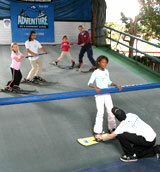 Kid's Learn on "Magic Carpet" Before Hitting The Slopes! Be sure your child expresses a desire to ski. Talk about skiing, rent a skiing video or look at a skiing magazine together. Ask him if it looks like something he'd like to try. If your child is unenthusiastic, it's probably better to pursue something else. Get professional instruction. 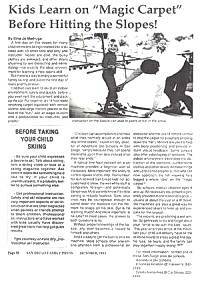 Safety and ski etiquette are two very important aspects of ski instruction that are often neglected when parents or friends attempt to teach children. 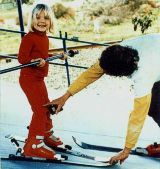 Professional ski instructors who have worked with kids usually have discovered great tools that help get quick results. 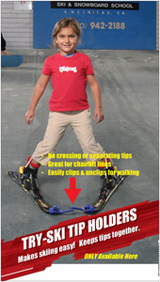 Tip courtesy of Kent Bry, professional ski instructor. A first day on the slopes for many children means being crowded into a ski class with 10 other kids and only one instructor. Noses are cold, the bulky cloths are awkward, and other skiers shushing by are distracting and intimidating - not exactly the ideal environment for learning a new sports skill. But there is a way to enjoy a wonderful family ski trip and avoid the first day of tears and frustration. Children can learn to ski in a controlled environment, safely and quickly, before you even rent the equipment and pack up the car. Put together an 18-foot-wide revolving carpet equipped with remote control and large mirrors placed at the foot of the "run," add an eager student and a professional ski instructor, and presto! "Children can accomplish in one hour what they normally would in an entire day on the slopes," says Kent Bry, director of Adventure Ski Schools in Encinitas, CA , "simply because they can spend more time up on their skis instead of on their rear ends." A typical one-hour session on a ski machine provides a beginner with all the basics. Most important, the ability to control speed and to stop. Remember, for sun-soaked San Diego kids not accustomed to snow, the wet white stuff is completely foreign--and potentially dangerous. Most parents know their little darling is virtually fearless. Sure, your child may be courageous enough to barrel down the steepest run the moment he snaps on his skis. But is he learning much? And more important, is he safe? In most cases, the answer to both questions is no. Without proper knowledge of the basics, any skier becomes a hazard to himself and others. And it's easy to get the basics on a ski machine. 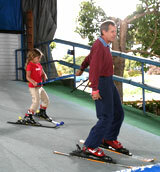 Most schools offer one-on-one attention from a professional ski instructor and the use of remote control to stop the carpet (to avoid falls or rolling down the "hill"). Mirrors are used to help with body positioning and provide instant visual feedback. Some schools also offer videotaping of sessions. The environment eliminates the distraction of the elements, cumbersome clothes and other skiers. All these things add up to confidence for a child who can now approach the hill knowing he's logged a whole "day" on the "magic carpet"! 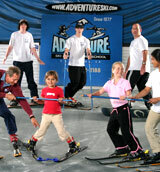 Adventure Ski School instructs children ages two and a half and up. All necessary equipment is generally provided at one reasonable price--usually at about the cost of a lift ticket. Ski machines are also a great way for experienced skiers to tone up and prepare for the season. The experts are predicting a wet winter. So get ready to ski and forget about your "what-to-do-with-the-kids" blues. This year when you arrive at the mountain your child will already have all the skills he needs to enjoy a great first day. No fuss, no tears, and the family can play together! Happy skiing!